Warfronts Are Rolling In – Will You Weather the Storm? Are you ready to Battle for Stromgarde? 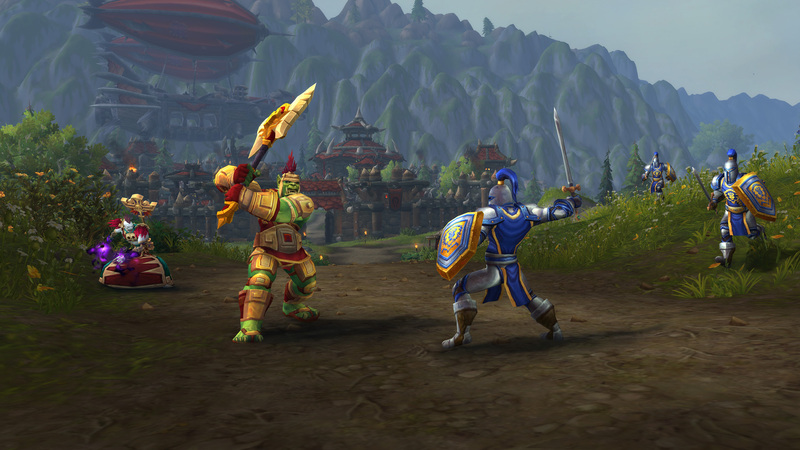 This new Warfront is the ultimate tug-of-war over control of a key location in the war between the Horde and Alliance. Once your faction controls the Stromgarde Warfront, you’ll be able to reap the rewards: access to a variety of new outdoor content for your faction in the nearby Arathi Highlands zone. Senior Producer Michael Bybee and Senior Game Designer Andrew Chambers sit down to give an overview of the new Warfronts feature. Arathi Highlands starts off in the hands of the Alliance, with the Horde preparing to launch their assault on Stromgarde to claim Arathi for themselves. But before they can go on the offsensive, the entire Horde faction across the entire game region (e.g. the Americas) will need to come together and provide war contributions to supply their army. While the Horde prepares to launch their assault during their contribution phase, the Alliance will have access to a variety of new quests in Arathi Highlands—as well as a special World Boss: Doom’s Howl. As long as your faction controls the Arathi Highlands, you’ll gain access to a new World Boss. The Alliance will need to defeat Doom’s Howl, while the Horde will need to face The Lion’s Roar—two fearsome engineering feats built to dominate the battlefield. Once enough contributions have been supplied by Horde players in your region, the Warfront: Battle for Stromgarde unlocks, and Horde players are able to queue for the experience. This queue remains open for a set duration, allowing players enough time to complete the Warfront on a schedule that works for them. Alliance players will be able to continue questing in Arathi Highlands during this time. After the Horde’s attack on the Warfront is complete, players can no longer queue for it, and the Horde takes control of Arathi Highlands—and all of the benefits that come with it. At this point, the Alliance begins their own resource contribution phase, and the cycle of war begins anew. To check the status of who has control of Arathi Highlands, visit the War Table either in Boralus Harbor for the Alliance or Port of Zandalar for the Horde. The cycle begins this week in each region with Horde players contributing war resources first. Players will need to head to Zuldazar Harbor to make their contributions, and you’ll be able to view your faction’s progress on the map. Once your faction reaches 100%, players from the Horde will be able to queue to enter the Warfront battle. There are many ways to contribute through a variety of quests, fueled by professions including Fishing, Herbalism, Alchemy, Mining, Blacksmithing, or even just a donation of gold you have on hand. Every little bit matters as you prepare to confront the opposing faction. In return for your efforts, you’ll gain Azerite Power and reputation with either The Honorbound or 7th Legion as a reward. Once your faction gains the ability to enter the Warfront, you’ll need to queue by using the War Table in either Boralus Harbor for the Alliance or Port of Zandalar for the Horde, where you’ll join with 19 other players to begin the Battle for Stromgarde. Great Hall – This mandatory “home base” is the first structure you’ll need to build before you begin pushing further into the map. It’s needed to construct other buildings. Barracks – This building will produce various troops which will follow you through the battlefield as your personal units. Armory – This building will allow you to upgrade the weapons and armor of units produced in the Barracks. Altar of Storms – This building bestows powerful player buffs (for a price). Workshop – Here you can produce powerful siege vehicles to destroy the enemy’s gates. As in the Warcraft RTS games, you’ll need to balance out your team strategy and focus on coordinating attacks on key points of interest throughout the map to maximize your success. As you build up, create troops, and siege weapons, you’ll need to work your way through the map and claim various points of interest. As the aggressor, you’ll need to defeat the sitting lieutenant for that base and capture the base flag. The reverse isn’t true for your opponents, however, and if you let them get a foothold or overwhelm your newly captured location, you’ll lose it to them. These points of interest provide interesting new challenges, access to some new troops, and sometimes some additional bonuses for your base or troops. If you’re participating in the Warfront as the Horde, you’ll need to push your way through the map, shoring up your defenses, creating troops, and defeating the enemy along the way toward your ultimate goal – Stromgarde Keep. If you’re participating in the Warfront as the Alliance, it means reestablishing yourself in Stromgarde and marching on the Horde stronghold, Ar’gorok. It won’t be easy as you push your way through the opposing forces, batter through the gates, and confront the final boss within these strongholds—you never know who could be waiting for you. To the Victors . . . There are plenty of spoils to be had within the Warfront, whether you’re a collector of pets, mounts, and toys, or you’re looking to bolster your Azerite and War Resources. You’ll also be able to gain new transmog set tints to add to your collection. View more of the available rewards on Wowhead’s guide. Familiar faces make up the regions star-studded roster.